Meat has been an important component of the human diet for centuries as a rich source of essential nutrients required for development, growth and maintenance. In addition to its nutritional value, meat production and processing provide employment and income generation in both commercial and informal farming sectors. However, in recent times, the sustainability of meat production, as well as the quality and safety of meat products has come under intense scrutiny as a result of the negative implications of livestock farming and meat consumption on the environment and human health, respectively. These concerns have become increasingly important to consumers and significantly influence consumption trends and the viability of the meat industry. Meat quality, safety and nutritional composition are influenced by the wide range of conditions to which meat-producing animals are exposed from 'farm to fork'. Hence, a complete understanding of meat and factors affecting it at every stage of the production chain is beneficial for the control and enhancement of meat quality. Additionally, adopting a systems approach is key to minimizing the negative implications of the meat industry on the environment and health. Current farming conditions are characterized by increasingly variable weather patterns and a diminishing natural resource base. As such, determining environmentally friendly, climate resilient and sustainable production systems is crucial. Pre- to post-slaughter processes tailored to maximize carcass yields, minimize losses and prevent health risks are essential. Furthermore, there is a growing need among consumers for transparency and detailed information on meat production and composition. Research that links the dynamics involved in all stages of meat production is necessary to sustain the positive role of meat in the human diet and to maximize the contribution of meat towards the alleviation of food insecurity, while easing the impact on the environment. A food system may be described as a collection of all the elements, activities and outputs that relate to the production, processing, distribution, preparation and consumption of food (High Level Panel of Experts (HLPE), 2014). A systematic view of any type of food production caters for the participation of producers, marketing channels, consumers, science and governance, and is geared towards economic, livelihoods and environmental harmony. A sustainable food system is one that delivers food security and nutrition for all, without compromising the resource base for future production (Garnett, 2014; HLPE, 2014). The Food and Agriculture Organisation (FAO) (2009) describes food security as the physical, social and economic accessibility of sufficient safe and nutritious food for all to meet their dietary needs and food preferences for an active and healthy life at all times. They identified the main pillars as availability, access, utilization and stability. Furthermore, the Committee on World Food Security (CFS) (2012) highlighted that combining food security with a sanitary environment, adequate health services, proper care and feeding practices for all members of the household results in nutrition security. Although the concept of food security has been well established and significant progress has been achieved, it continues to be a global challenge. It has been estimated that the global demand for food will increase by more than 20% in the next 15 years (World Bank Group, 2015), which might result in the situation worsening if there are no mitigation strategies to implement. Garnett (2014) reported that there are different views on how sustainability of food systems can be achieved. With this in mind, there is a need to balance various approaches to address this. Regular meat consumption, within limits, makes a valuable contribution towards meeting daily nutritional requirements for growth and maintenance of the human body (Hambidge et al., 2011). For centuries, meat has held a prominent position in the human diet as a rich source of high-quality protein, essential amino acids, B vitamins and minerals (Pereira & Vicente, 2013; Leroy & Praet, 2015; De Smet & Vossen, 2016). The nutrients found in animal source foods are of high quality and are readily absorbed by the human system (Schönfeldt et al., 2013). Meat contains a sufficient amount of complete and highly digestible protein with all of the essential amino acids to support growth, development, maintenance and repair of the human body (Wu, 2016; Bohrer, 2017). It provides heme iron, an exclusive animal source nutrient, which is more readily absorbed than non-heme iron (Schönfeldt & Hall, 2011). It is also an important source of vitamin B complex (Speedy, 2003), especially vitamin B12 (Pereira & Vicente, 2013), which plays an important role in maintaining the nervous system and the body's genetic material, through the synthesis of methyl donors, which are necessary for the development and maintenance of methylation patterns in DNA, which determines gene expression, chromosome conformation and thus phenotypic differentiation across generations (Zingg & Jones, 1997; Champagne & Curley, 2007; Fenech, 2012). Regardless of these essential qualities, meat has gained a negative image over the years owing to its association with negative environmental and health implications. Garnett (2014) highlighted the need to redesign the food system such that it enhances nutritional benefits with limited damage to the environment. The same approach could be used to counteract the reputation of meat in human diets, with emphasis on a proper consumption guide. The main drivers of this would be science and governance. Therefore, the aim of this paper is to consolidate the literature that demonstrates the dynamics involved in the meat production chain and to promote the dietary value of meat in a sustainable food system. Throughout the ages and around the world, meat has been a crucial part of the human diet as a major source of protein, fat and essential micronutrients (Muchenje & Njisane, 2015; Boada et al., 2016). Klurfeld (2015) reported that through the improved quality and availability of protein when exposed to heat, the consumption of cooked meat is proposed to have been an important contributing factor to the evolutionary increase in human brain size, and has thus been linked to the success of the species. Though fat from animal foods is mostly saturated, and may cause health challenges if consumed in excess, it is necessary in human diets for the development of cell membranes and is also an appreciable source of energy for growth and development (Nantapo et al., 2015; Scanes, 2018a). Aside from being viewed as a luxury and as being high palatable, meat intake renders multiple health benefits. According to Cashman & Hayes (2017), lean red meat is an important source of nutrients of public health concern, including vitamin D, potassium, iron and zinc. These nutrients are crucial in the diets of women and children. In addition to epigenetic effects (Champagne & Curley, 2007), early-life environmental and nutritional conditions determine the structure and functioning of the brain and thus the child's development (Walker et al., 2011). Therefore, pregnant women require additional nutrients, particularly iron, for maintenance and to support foetal development. Iron deficiency anaemia contributes to delayed development in millions of young children (Walker et al., 2011). Adequate intake of essential micronutrients is critical to the mental and physical development of children, and improves the productivity and work capacity of adults (Fan & Brzeska, 2014). In all countries, food systems make a significant contribution to employment and job creation (Townsend et al., 2017). Globally, about 40% of the gross value of agricultural production comes from livestock production (FAO, 2015). 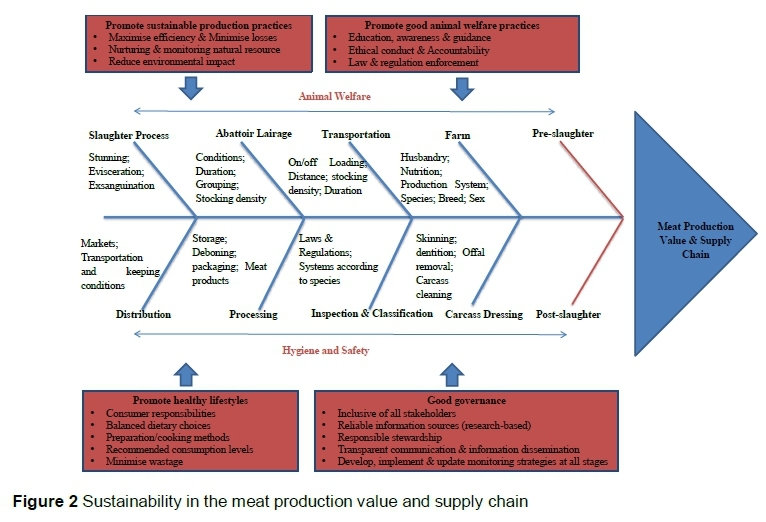 Figure 1 illustrates the meat production and processing chain from farm to consumer level. Livestock production plays an essential role in livelihoods through the provision of jobs (labour), income (employer and employees), food and nutrition (producer and consumers) and many other benefits (animal draught power, manure, clothing, etc.) (Herrero et al., 2009; Capper, 2013; FAO, 2015). It has been estimated that more than two thirds of the human population receive a significant amount of their income from activities related to livestock production (Tarawali et al., 2011). Because of its importance in growth and development, which is crucial in human livelihoods, a sustainable supply of livestock protein will be beneficial. However, owing to its rich nutrient and moisture content, fresh meat is highly perishable and prone to spoilage (Zhou et al., 2010). To counteract this, various processing measures can be employed. Primarily, meat processing is done to extend product shelf life and/or to add value by improving the flavour and organoleptic properties (Boada et al., 2016). This improves the distribution and accessibility of meat and opens up avenues for further job creation and higher income. According to the FAO (2003), the world food economy has been characterized by a dietary shift towards increased consumption of meat and livestock products. While it is clear that meat provides multiple rewards for one's wellbeing, a negative side has emerged over the years. Scientific reports have identified various factors that come into play in the diminishing reputation of meat. However, this information is often misquoted and misused before it reaches the consumer. Cashman & Hayes (2017) reported that since meat first caught the attention of the media, many conflicting messages have contributed to misconceptions and confusion over its role in healthy diets, and over the ways in which it is produced. This section seeks to review the pros and cons of livestock production and its impact on the animals' wellbeing and the environment; matters surrounding meat accessibility, distribution and cost; lifestyle and beliefs; and health implications. There has been growing concern and controversy over animal welfare in livestock farming and the deteriorating condition of the environment. Generally, animal welfare was developed as a scientific field because of societal ethical apprehensions about animal treatment (Fraser et al., 1997). The definition of this concept has evolved to cover the five freedoms that were developed by the UK Farm Animal Welfare Council in 1979 to ensure sufficient conditions that nurture animal wellbeing and provide basic guidance for the society. However, the increased pressure to maximize production of animal protein at minimal cost has led to difficulties in prioritising animal wellbeing, because market demand and economic feasibility are often highly ranked in industries (Phillips & Kluss, 2018). Various criteria are used to evaluate the indicators of good welfare and how to achieve it, with the science community having the most potential to provide accurate direction in the field (Fraser et al., 1997). Despite all the scientific work that has been done over the years, providing recommendations to minimize animal discomfort, some groups still perceive livestock production for human consumption as a 'cruel' act. This is often vocalized through popular communications (i.e. blogs, and op-eds) and social media platforms. From a social point of view, their strong perceptions on the matter are justified. However, this should not be taken as a standard for all. Furthermore, this has led to suggestions that the consumption of meat is unnecessary and can be lived without, if one looks at other nutrient (particularly for protein) sources (plant based). Such reports, however, often leave out in-depth information on the nutritional components of plant-based protein sources. For instance, Thornton et al. (2009) reported that protein produced from plants and animals provides different nutritional value for human (especially children) utilization. In addition, Capper (2013) highlighted that the production of all food types (not only animal foods) contribute to environmental depletion. The entire global food system plays a substantial role in the production of greenhouse gasses (GHG) (Garnett, 2011). It is only fair to unpack all the dynamics involved to allow consumers to make informed decisions about their diet choices. In some parts of the world, meat consumption is increasingly being challenged based on environmental and human health implications (Tilman & Clark, 2014; Mathijs, 2015). This has become one of the arguments that have been used to support the suggestions for a complete diet shift. While livestock production profits society, it strains natural resources and deteriorates environmental quality (Herrero et al., 2010). Reports have been made that livestock production results in water pollution and depletion, and land degradation, and has a negative impact on biodiversity if farming practices are not managed correctly (Thornton, 2010; Meissner et al., 2013). Furthermore, this industry directly (through grazing) and indirectly (through feed production) utilizes the largest proportions of the world's land (FAO, 2015). This review does not dispute these findings, but seeks to facilitate a harmonized approach to mitigating the consequences in order to promote sustainable production. With the established negative correlation between livestock production and the environment - and its contribution to the increased occurrence of unconducive climatic conditions - it is also worth noting the reverse negative impact of the increasingly variable environmental and climatic conditions on animal performance, survival and the sustainability of production. Generally, the livestock industry needs to be sensitive to ecological upkeep, profitability, social responsibility and their balance to remain sustainable and contribute valuably towards livelihoods and food security (Capper, 2013). For various purposes within society, livestock production has always been at the core of human activities. However, owing to developing global trends, there has been a growing shift towards farming for profit. The increase in global animal production suggests that the consumption of animal food sources is on the rise worldwide (Scanes, 2018a). However, it was earlier identified that there is need to promote livestock production and product consumption in developing countries for physical and mental health benefits (Speedy, 2003). This is still a need considering that most developing countries are among the food insecure communities in the world (FAO, International Fund for Agricultural Development (IFAD), & World Food Program (WFP), 2015), with the population continuing to expand. Kearney (2010) reported that consumption of non-animal-based protein sources is still significantly high in many developing countries. Although animal-sourced foods have the potential to improve human physiological conditions in the developing world, they are often inaccessible owing to economic constraints (Capper, 2013). Price sensitivity is a critical determinant of food choice decisions (Ahmed & Anders, 2012), especially for low-income consumers in the developing world (Rani et al., 2013). Research suggests that the demand for meat (and other animal foods) in developing countries will continue to rise in the decades to come (Speedy, 2003; FAO, 2015). In contrast, a declining trend is expected in high-income countries (Vranken et al., 2014) owing to public health issues associated with overconsumption (Tilmann & Clark, 2014; Dietary Guidelines Advisory Committee (DGAC), 2015). In addition, some of the non-economic influencers include meat quality and product consistency, along with health-related nutritional and food safety concerns (Oyewumi & Jooste, 2006). There are specific target markets for products of varying quality, with the best-quality products often being distributed and more accessible in high-income societies. For various reasons, such as accessibility, affordability, convenience, some consumers, particularly from resource-limited communities, opt to purchase meat from informal markets. The conditions in these markets may expose the product and the consumer to health hazards owing to a lack of safety regulations (Hoffmann & Bernhard, 2007; Rani et al., 2017). Hence, consumption patterns differ significantly among consumers from different socio-demographic backgrounds (Webb & O'Neill, 2008), and are influenced by a number of factors, including income levels, technological advances, culture and urbanization (Mathijs, 2015). For instance, increased income levels and lower prices have been linked to higher consumption of animal-based and processed foods (Kearney, 2010; FAO, 2017). For the longest time, livestock production, slaughter and meat preparation for human consumption have been guided by traditions (Farouk et al., 2014). The modern-day global community has been strongly drawn to the idea that one's longevity is affected by one's lifestyle habits (physical activity, consumption of a balanced diet, psychological wellbeing, income level, among others) (Chen, 2011; Hollis-Sawyer & Dykema-Engblade, 2016). Generally, consumers have become more sensitized to health-promoting lifestyles and their benefits. However, from a dietary point of view, what constitutes a consumer's plate is also linked to religion, beliefs and unavoidable health implications such as allergies. In a review on meat consumption versus longevity, Singh et al. (2003) concluded that low levels of meat consumption have been linked to longer life expectancy. However, they indicated that more extensive work needs to be conducted to make substantial inferences on the subject. According to the World Health Organisation (WHO) (2007), the main causes of death in developed countries are non-communicable diseases (NCDs), including cardiovascular disease, chronic obstructive lung disease, cancers, diabetes and dementia, while infectious diseases (HIV/AIDS, lung infections, tuberculosis, diarrhoeal diseases, malaria) and complications during pregnancy and childbirth are leading causes of death in developing countries. However, a recent report on the 2015 Global Burden of Diseases highlighted a shift towards increasing incidences of NCDs in developing countries with rising levels of industrialization and urbanization (GBD, 2015; 2016). The contributing factors include increased consumption of high calorific foods (sugar, fats and animal products) and reduced physical activity (Shetty, 2002). In addition, diets high in fat can have negative effects on health (Mensink et al., 2003), especially if overconsumed (FAO, 2015). Banting is currently the most popular diet, trending on social media. It strongly promotes the consumption of meat (excluding most processed products), with a high-fat-low-carb approach. However, there is a dearth of scientific literature that details the processes involved. This is in line with the noted trend of modern society to rely more on technology and media to influence their dietary choices and lifestyle habits (Muchenje et al., 2018). Veganism, on the other hand, completely disqualifies the consumption of meat for animal welfare reasons, with an extension to health and environmental benefits. It is a strict form of vegetarianism, in which consumption of all forms of animal products is prohibited (Cherry, 2006). By those who practise it, such an approach is believed to have superior health and environmental impacts. However, there is no clear direction for disposal of livestock or counteractive strategies to fill the nutritional, social (farming and livelihoods) and industrial (fertilizers, clothing, pharmaceuticals, economy) gaps that would result from eliminating animal agriculture (Capper, 2013). It is essential that transparency regarding meat consumption and health risks (and others) is maintained before recommendations for dietary and lifestyle shifts are made (Lippi et al., 2016). For instance, there is a need to highlight that while some of the popular plant-based foods (such as soy products and herbs) provide nutritional and sometimes medicinal benefits, if they are not used with caution, they can cause negative health implications and sometimes alter hormonal and behavioural responses (Wanibuchi et al., 2009; Jefferson, 2010; Wasserman et al., 2012, Burgess & Wilson, 2018). Lastly, some consumers abide by their religious regulations about the consumption of certain food types, particularly meat (Muchenje & Njisane, 2015). However, the restrictions are usually based on spiritual beliefs linked to specific species and slaughter methods, not on meat as a whole. People's attitudes towards animal slaughter and meat consumption are shaped by their spirituality and ideology (Farouk et al., 2014). For instance, although pork is shunned in the Jewish, Muslim, and some Christian denominations (i.e. Seventh Day Adventists), it is still the most preferred meat type of the global population (Scanes, 2018b). The last few decades have been characterized by growing interest in the relationship between food consumption and health (Jiménez-Colmenero et al., 2001; Urala & Lähteenmäki, 2003). A linkage has been established between dietary patterns and the incidence of chronic illnesses and non-communicable diseases (NCDs), such as diabetes, cardiovascular diseases, hypertension, cancer, osteoporosis and obesity (Bloom et al., 2011). Perceptions of meat consumption from a nutritional standpoint have been negatively influenced by the association of certain meat constituents, such as saturated fatty acids (SFAs) and cholesterol, with increased risk of NCDs (Jiménez-Colmenero et al., 2012). High consumption of fat is often associated with increased incidences of cardiovascular diseases, obesity and cancers (Nantapo et al., 2015). However, Lippi et al. (2016) reported that one's overall choice of diet plays an integral part in the formation of chronic diseases such as cancer. The quantity and types of meat and meat products that are consumed are also important factors. For instance, processed meat products contain higher levels of SFAs and cholesterol compared with fresh meat, and their consumption has been linked with incidences of colorectal cancer, while there is limited literature that relates the consumption of fresh meat to the prevalence of cardiovascular disease and Type 2 diabetes (Boada et al., 2016). High temperature cooking (grilling, pan frying, barbequing) and meat-processing operations (curing, smoking, fermentation) have been reported to generate chemical carcinogenic and mutagenic toxins, including polycyclic aromatic hydrocarbons, heterocyclic aromatic amines and N-nitroso-compounds (McAfee et al., 2010; Alaejos & Alfonso, 2011; Alomirah et al., 2011; Bouvard et al., 2015). The safety of red and processed meat consumption came under intense scrutiny following the International Agency for Research on Cancer (IARC) evaluation on the carcinogenicity of their consumption (Bouvard et al., 2015). This evaluation assessed over 800 geographically and ethnically diverse epidemiological studies, investigating the association between red and processed meat consumption and cancer, and reported that there is sufficient evidence for the carcinogenicity of processed meat consumption in humans, classifying processed meats in Group 1 (carcinogenic to humans) and red meat in Group 2A (probably carcinogenic to humans). The report was met with significant attention in the public media and had many mixed responses, leading to some confusion among consumers on this issue (Cashman & Hayes, 2017). Many scientists argued that the findings were based on observational studies, which were not able to define a cause and effect relationship, that they did not put the magnitude of the risk into perspective, causing unwarranted alarm for consumers (Klurfeld, 2015). It was argued that the nutritional benefits of processed meats should not be ignored (Jiang & Xiong, 2016) and that processed meat had been placed in the same carcinogenic category as cigarettes, although the risks associated with the two products are by no means equivalent. Statistics indicate that smoking three cigarettes a day increases the risk of lung cancer by 600%; while eating 50 g of processed meat daily increases the risk of colorectal cancer by 20% (Scientific Media Centre (SMC), 2015). Similarly, numerous studies have linked SFA consumption to increased risk of cardiovascular disease and colon cancer. However, the role of SFAs in the pathogenesis of heart disease has been called into question in the last few years (Lacroix et al., 2017). Some argue that there are apparent methodological limitations and inconsistencies in many of the studies that associate SFAs with heart disease and consequently question some evidence that has been used to make dietary recommendations on this basis (McNeill, 2014). Klurfeld (2015) highlighted several limitations in many of the studies that relate meat consumption to increased risk of disease, including the accuracy of intake estimates (which depend on consumer reports), experimental design (observational and insufficient periods) and inability to account for the effects of correlated dietary and lifestyle habits (e.g. physical activity, fruit and vegetable intake, smoking and alcohol consumption). Furthermore, the paper expanded on the inefficiency of conducting such studies because of ethical implications and consumer willingness to be consistent with certain diet plans towards the intended goal. Therefore the nature of the studies and the contradictory outcomes of these bring out the question of reliability on the matter (Klurfeld, 2015; Boada et al., 2016). One of the prominent public necessities is safe and healthy food (FAO, 2015). Food safety is one of the key aspects of a food secure society (FAO, 2009). In most food sources, particularly in those that are animal derived, food safety has constantly been threatened by the outbreak of zoonotic diseases and the prevalence of related foodborne illnesses. Multiple pathogens are transferrable between food producing animals and consumers, including Escherichia coli, Salmonella, Campylobacter, Listeria and Vibrio (Swartz, 2002). Some of these are transferred to the animals through ingestion (Crump et al., 2002), and then later consumed by humans in contaminated animal foods, while some foodborne illnesses result from infection through unhygienic handling at various stages of the production chain. According to the WHO (2018) report, the recent outbreak of Listeriosis in South Africa was the largest ever recorded; 674 patients were reported as of March 2018, with 27% mortalities. The identified listeria strain (Listeria monocytogenes ST6) was traced back to the processing environment of a manufacturer of a ready-to-eat processed meat product (polony). Consequently, of the 15 African countries to which South Africa exports, 12 recalled and banned imports of the affected meat products, while the rest banned imports of all food products. Furthermore, the severe health impact of foodborne infections has been linked to increased antimicrobial resistance of pathogens over the years (Swartz, 2002). The improper use and overutilization of antibiotics in agriculture has promoted the development of antibiotic-resistant bacteria, which are most commonly transmitted to humans via the food chain (Van den Honert et al., 2018), specifically through consumption of contaminated food and water, as well as direct contact with affected animals (McNulty et al., 2016). However, this does not call for panic or drastic measures such as eliminating meat consumption, but requires a vigilant approach towards implementing prevention and control strategies at all stages of the meat value chain. Multiple approaches such as vaccination, biosecurity, selection for disease resistance, antibiotics (including natural forms), and proper nutrition have been developed (Scanes, 2018b; WHO, 2018). Owing to emerging controversies within the food production system, the sustainability of livestock farming has become a spectacle (Capper, 2013). To reach equilibrium in the food system, there is need for a mind-set shift towards the essentiality of livestock production, particularly for food purposes (Herrero et al., 2009). However, there is no blanket approach to this as various populations are faced with unique challenges, which affect different components of the system. Furthermore, it has been predicted that changes may have to be implemented in local, national and regional livestock industries (Rust & Rust, 2013). Meat consumption has increased over the years in developed countries and has continued to rise in the developing world, although the trend is masked by population growth (Speedy, 2003). It is important for the developing world to maximize livestock production for human consumption to aid in the battle against malnutrition and nutrient deficiencies, while the developed world needs to make adjustments in environmentally related concerns (Capper, 2013). Hence, the development of interventions - including policies, production practices and innovations tailored to suit sustainability challenges of specific regions - is a resonating global research theme. Generally, the series of activities in the food chain, from farming, processing, storage, distribution, retailing, preparation methods to disposal of waste all contribute towards the production of GHG emissions (Garnett, 2011). In identifying the way forward, it is important to dissect the system, following a 'farm to fork' approach, to determine the definite sources and identify possible solutions at each stage. Figure 2 presents a summary of the measures that can be adopted at all stages of the meat value and supply chain to enhance sustainability. Through advances in research, there have been adjustments and adaptations in livestock production systems to make them more sustainable. Notable increases have been observed over the years in various agricultural outputs, including livestock industries, and this can be attributed to the application of improved scientific principles, particularly on plant and animal breeding, nutrition and health (Scanes, 2018b). Selection of animals and breeds that are best adapted to the climatic conditions of production area can improve the efficiency of natural resource utilization. The prioritization of good animal welfare practices at all stages of production is important for improving the quality of the animals' lives, and encourages production efficiency and the perceptions of consumers towards meat production. Farming with non-conventional species (e.g. rodents, ratites, ungulates, camelidae and reptiles) (Hoffman, 2008) could also be promoted to increase meat availability and accessibility. Traditionally, livestock are fed on crops and foodstuff that humans deem non consumable (Garnett, 2011). This is still a common practice in communal set-ups, where monogastrics are the primary users of household waste for nutritional purposes, and ruminants graze on natural pastures. For commercial production, research on non-conventional feed resources (e.g. agricultural by-products, underutilized crops, insects) as suitable alternatives to those commonly utilized for livestock and human nutrition is on the increase. At the processing level, there is need to maximize the efficiency of resource utilization to ensure sustainability (Augustin et al., 2016). Advances must also be made to improve the enforcement of regulations for quality assurance and product safety. The development of innovative meat products with the addition of natural bioactive components with health benefits is an emerging approach to enhancing product quality, safety and nutritional value (Decker & Park, 2010; Hygreeva et al., 2014; Augustin et al., 2016). Although most literature links the need to maximize food production to population increase, another identifiable source could be because of various forms of food wastage and lack of coordination between economies. Dorward (2012) summarized that food losses in the developing world are linked to pre-consumer inefficiencies in storage and distribution mechanisms, while consumer choices are more to blame in the developed world. There is room to take advantage of this to bridge the gap between excess and opportunities to supplement areas in need (food security) and minimize GHG emissions. Exaggerated food wastage was highlighted as a 'double contributor' to total GHG emissions from the food chain, during production, distribution and waste disposal; and thus important to reduce (Garnett, 2011; Dorward, 2012). Based on specific requirements, Dorward (2012) recommended that governments ought to develop policies that address food wastage and its environmental impacts, considering both technological and behavioural aspects. Concerning meat consumption, moderation remains the most reasonable recommendation, rather than eliminating meat from one's diet (Muchenje & Njisane, 2015). Generally, it is in human nature to possess conflicting views on various matters, which provides a conducive and promising environment for progressive discussions. In light of the pros and cons discussed in this paper, the role of meat in the human diet remains essential. Researchers have attempted to resolve the burning issues surrounding food and livestock production, and recommendations have been developed and communicated on multiple platforms. However, to ensure the sustainability of any food system, constant evaluation and improvement are necessary. Science communities should view the issue of sustainable food systems as being multi-disciplinary and should facilitate such an environment in order to progress. Considering both negative and positive factors at play, this approach would foster harmony and provide conclusive guidance, with the understanding that there are conditions that cannot simply be phased out. However, assuming accountability and continuous monitoring by all stakeholders (to their capacities) might just be the best solution. The responsibility for providing reliable background to navigate possible pathways lies with research, backed up with solid governance, while decisions on specific diets remain in the hands of the consumers. The authors would like to acknowledge the DST-NRF Centre of Excellence in Food Security (Project ID: 170275); National Research Foundation (NRF): Scarce Skills Postdoctoral Fellowship (Reference: SFP150813137239, UID: 99687) and the Govan Mbeki Research and Development Centre (GMRDC, UFH) for supporting this research. The paper was conceptualized by VM, FEM and YZN; FEM and YZN drafted the manuscript and all authors critiqued the final version for submission.